THIS EVENT IS ONLY OPEN TO HEYTHROP HUNT PC, DURHAM’S FARM & REGAL EQUESTRIAN PC CENTRE MEMBERS AND THUS ONLY TRAINED FIRST AIDERS WILL BE IN ATTENDANCE. ENTRIES CLOSE Friday 12th April 2019. Late entries: £2.00 extra only if space permits. No entries will be accepted without remittance. No Combined Training entries on the day. 1. 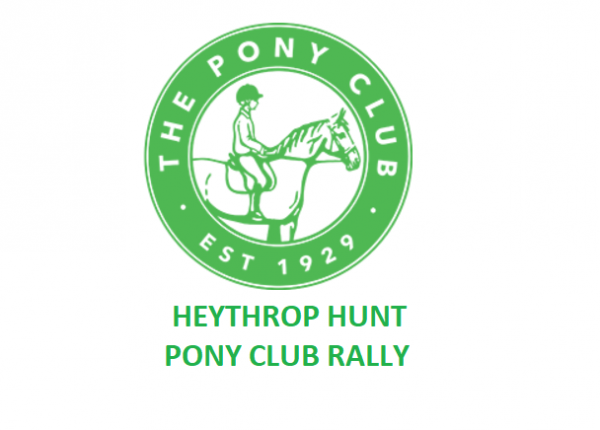 Times will be published on the Horse-events website on Saturday 13th April after 7pm. Please use our website for updates on this event due to the weather. 3. Ponies/Horses may ridden by more than one rider in the same or different classes. Ponies/horses will only be able to compete in a maximum of two Combined Training classes. 4. THOSE ENTERING IN MORE THAN ONE CLASS MUST BE PREPARED TO DO THEIR SHOW JUMPING BEFORE THEIR SECOND DRESSAGE TEST IF APPLICABLE. DRESSAGE TESTS MUST BE RIDDEN AT THE TIME GIVEN PLEASE. 5. Age to be taken on 1st January 2019. The show is run under PC Horse Trial Rules 2019. Hats must be worn and fastened at all times when mounted. All hats worn must comply with Pony Club rules which can be downloaded from www.pcuk.org and be tagged with a turquoise hat tag. Body protectors are recommended for show jumping. 9. The Organiser’s and Judges decision is final. They reserve the right to alter, amend or cancel any part of the competition or refuse any entry without stating a reason. 10. All competitors are to present themselves to be tack checked 15 minutes before their dressage time. Please make sure that you are familiar with the tack rules for dressage. Please note that all children remain the responsibility of their parents and/or guardians at all times and no responsibility is accepted by the organisers. Times will be published on the Horse-events website on Saturday 13th April after 7pm. Please use our website for updates on this event due to the weather. Durhams Farm Riding School is a family run business situated in a beautiful area of The Cotswolds. Our farm spans 60 acres of glorious countryside set between the popular market towns of Moreton in Marsh, Stow on the Wold and Chipping Norton. The riding school was founded in 1994 to bring together people of every background and all ages to have fun and learn new skills. Pat and her wonderful team are dedicated to providing you with the best possible service and a horse riding experience that is second to none. We offer Cross Country Course Hire, Riding Lessons, Hacking, Happy Hooves Riding Club and Pony Days. We hire out our cross country course from May until October depending on ground conditions and for the cost of £15 per horse. We have around 30 well built and inviting xc course fences ranging from 1’9 to 3ft. It’s an excellent course for children or novice horses and ponies with a variety of both challenging and straight forward fences. Spanning 3 fields and in total around 40 acres including jumps in and out of our woodland area. Please contact us for more information. HEALTH & SAFETY: The organisers of this event have taken all reasonable precautions to ensure the health and safety of everyone present. For these measures to be effective everyone must take all reasonable precautions to avoid and prevent accidents occurring and must obey the instructions of the organisers and all officials and stewards. LEGAL LIABILITY: Save for the death or personal injury caused by the negligence of the organisers or anyone for whom they are in law responsible, neither the organisers of this event or the Pony Club nor any agent, employee or representative of these bodies nor the landlord or his tenant, accepts any liability for any accident, loss, damage, injury or illness to horses, owners, riders, spectators, land, cars, their contents and accessories or any other personal property whatsoever, whether caused by their negligence, breach of contract or in any other way whatsoever. Entries are only accepted on this basis.